If you are currently experiencing a mental health emergency, please contact the Military Crisis Line at 800-273-8255 and Press 1 or text 838255 for online chat. This service is available 24/7 and completely confidential. The military has a problem treating mental health in active and retired military members. Not surprisingly, there is not a lot of research done about the mental health of dependents. But should the military be responsible for the mental health of dependents? If they are responsible, what kind of treatment should they offer? How do dependents find out about these treatments? Since I am a military spouse, I figured I could get some more personal and honest answers. I decided to reach out to fellow spouses the best way I knew how...Facebook. There are TONS of military spouse Facebook groups. How did I find out what a redeployment ceremony is like? Facebook groups. How did I learn what vet to pick when we moved? Facebook groups. Military spouses love Facebook. So why not take advantage of it? I reached out to spouses of all walks of life. I received 215 anonymous responses to a six-question survey. I have concluded that the best way to present some of my findings, is through infographics and charts. 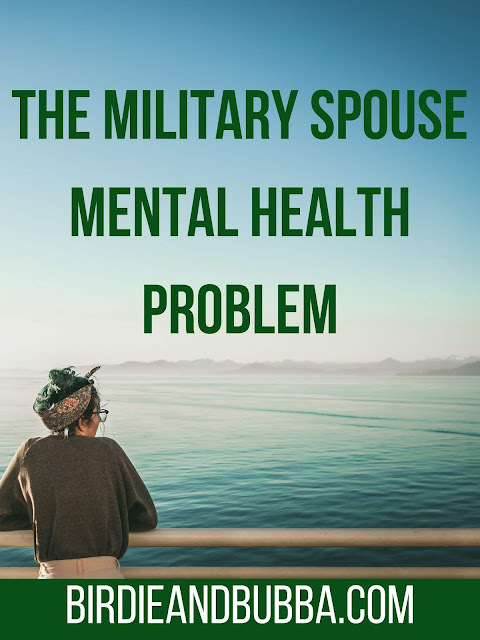 I was shocked that 66% of spouses surveyed said they had a mental health problem while being a military spouse. Over half. That is a problem. But still, is it the military's problem? I asked, "What do you think the military could improve in regards to mental health awareness for dependents?" While the answers to some questions varied I noticed two common responses. Many spouses fear the stigma of seeking help and/or do not know who to turn to for help. One spouse commented that the military needs to, "[Have] information and resources more readily available and easy to access. 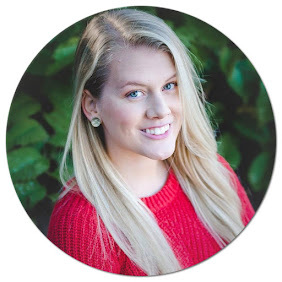 As a dependent, there were times when I tried seeking out help but didn’t know who or where I could turn to. I didn’t want to get my husband's chain of command involved and aside from them my husband was also at a loss as to where to guide me." Another spouse wrote, "My husband and I arrived at his FDS last year. The integration with his unit was horrible. Of course, there have been changes to Tricare, so it is difficult to keep people up to date. I don't feel like they care in general though. 40% of soldiers on our base just deployed. Wives are on Facebook every day asking what to do about depression." I also received a few responses from spouses who felt the military does enough already. "I really do not think it is the military's job to coddle us. My husband has deployed for 15 months, 13 months, and 3-12 month deployments. If I have an issue, which anxiety and depression are my good friends I pick up the phone and call a mental health care professional. The military gives us some of the cheapest, maybe not the greatest, health care out there. Please use it"
"I had depression and anxiety recognized immediately by my PCM and I was referred to a mental health professional immediately. I loved working with her and. I have the tools I need to help myself and my family. I’ve been very very pleased with my mental health care from the army." The military does have programs put in place for military members and their families. Military Family Life Counselors provide non-medical counseling free of charge to military members and their families. TRICARE also works with primary care doctors to properly refer and treat mental health issues. Military One Source is a great way to learn more about what resources are available to you. These are fantastic resources to help navigate what treatment route is best for you. However, no mental health problem is the same. Everyone has a different experience. A person might take one treatment route or multiple methods of treatment. A one size fits all approach is often the issue with the military mental health treatment. 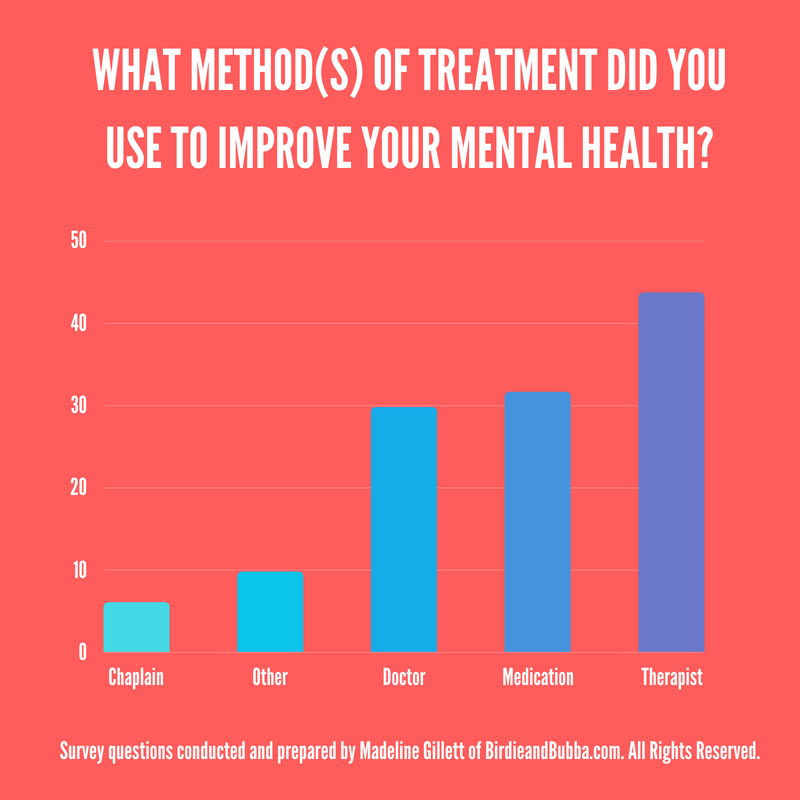 I asked people to include what their treatment was when they selected other. What is an effective treatment for some, could be detrimental to others. There are so many great options that are simply poorly advertised and promoted. Spouses can feel forgotten and lost in the system. Family Readiness groups are sometimes slow to relay these resources to spouses...if they do it at all. Since FRGs are all run differently, there is no way to know who is getting what kind of information. A spouse commented, "Mental health is complicated for EVERYONE and a stay at home spouse is less likely to be noticed having a mental health issue than an active duty member just based on visibility. Supervisors and unit leadership should be asking members about their families and then following up." 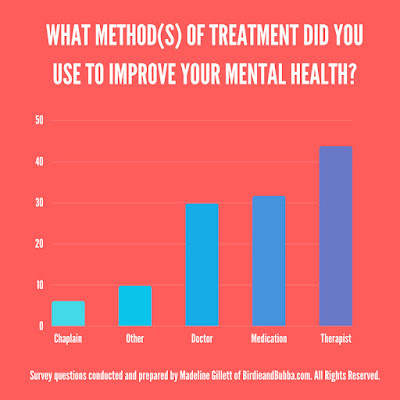 The military has a very long way to go when it comes to mental health treatment. Mental health has only become a more publicized issue in the last decade. We cannot expect changes to happen overnight but we should not become complacent. Our military members and families deserve much more. What an important topic, Maddy! As a military spouse, I have repeatedly struggled with accessing quality mental health resources. Like many of your respondents mentioned, I found my bet referrals through friends and chaplains. I read "Homefront 911" by Stacy Bannerman and discovered that I was far from the only spouse struggling to find effective resources. Thanks so much for bringing such a critical need to light!!! What interesting findings! I am really curious whether branch of service played a factor in knowledge of resources available. My initial thought would be yes, but you never know!